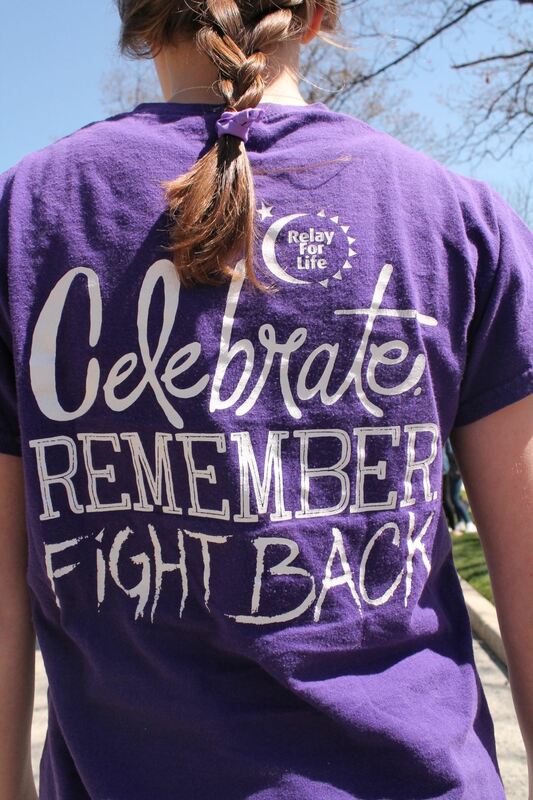 Relay for Life is a worldwide event that has one, clear objective; fight back against cancer. 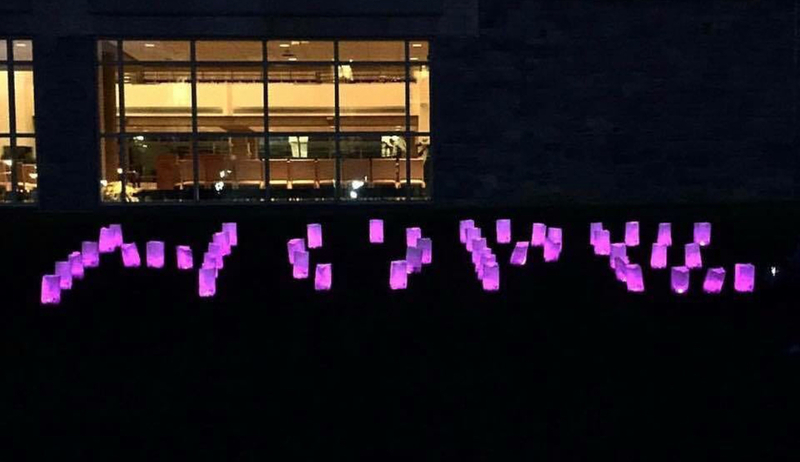 Every year, about 5,000 Relay for Life events happen all over the world, including our very own event here at Saint Joseph’s University. Relay for Life, which doesn’t occur until April, holds as one of the most popular events to take part in here on campus. Of course, for an event so worthwhile and special, a lot of strenuous handwork and detailed planning is needed. 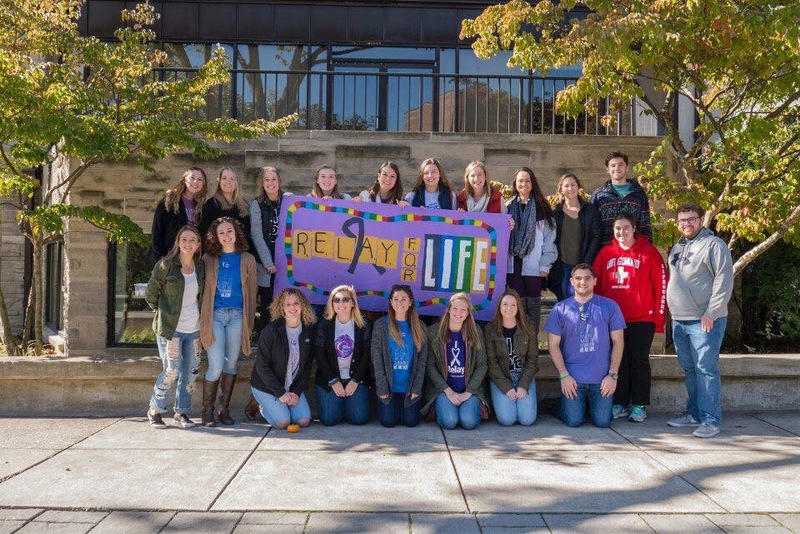 From organizing smaller events throughout the school year, to having fundraisers for collecting donations, the Relay for Life committee takes substantial steps to ensure that April’s event goes off without a hitch. Did you ever know that so many steps were required so that we could tell cancer to take a hike? If you thought beginning to plan for Relay in September was early, think again; it actually starts in the summer! 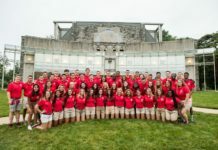 Sophomore committee member Kara Evans said, “We start planning Relay the summer before the fall semester.” What exactly is being planned during the dog days of summer, you may ask? Jill Rogers, chair to the Executive Board, is here to answer all of your questions. “The first step in planning for Relay is to assemble an incredible Executive Board, and then the actual committee.” So, after an Executive Board of about 30 people is finalized, they then begin to recruit people to sign up for the actual committee. These are broken down into several categories; Theme, Team Development, Activities, Marketing, Luminaria, Survivorship, Event Fundraising, and Corporate Scholarship. When asked about how to become a part of a sub-committee, Jill said, “To be on a committee, we send around an interest form at the beginning of the school year and then we place people on the committees based off their interests!” Constructing a strong, hardworking committee is an essential first step, because the committee is responsible for not only preparation, but also to make sure everything runs smoothly the night of the event. The next crucial step, especially in this year’s case, is to decide on a theme for the event. Technically, there doesn’t have to be a theme, but “it’s a fun way to decorate and make things different year to year,” Jill added. 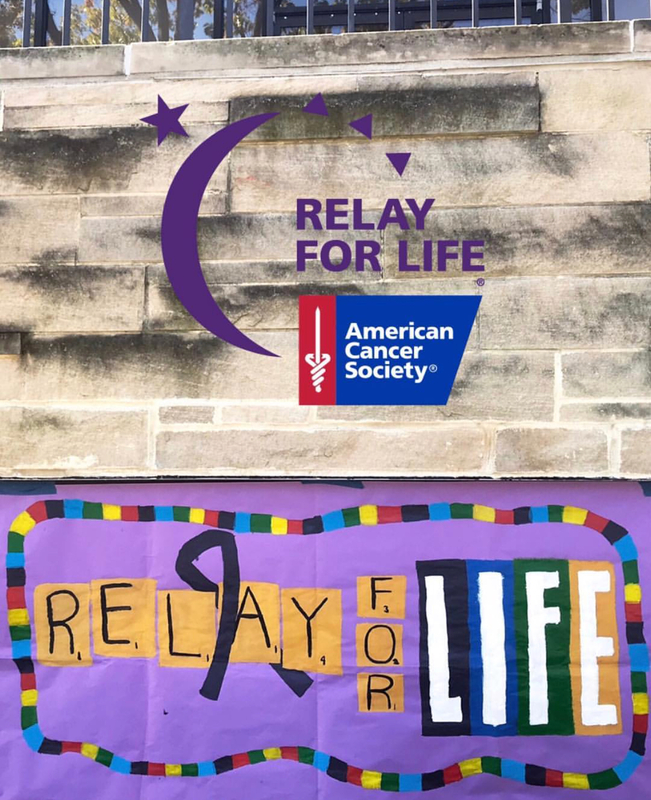 The theme is also incorporated into every aspect of Relay, including the activities, Survivor dinner, decorations, and the luminaria ceremony. Kara Evans, who is the chair of the Theme Committee, walked us through the process of coming up with this year’s theme… Board Games! 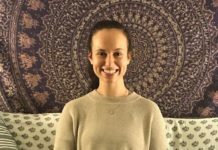 Kara said, “At our first meeting in the beginning of the semester, the theme committee came up with different theme ideas, which we then put into a poll. Each committee member voted on what their top five choices were, and then myself along with three of the executive chairs decided on which theme would be the easiest to carry out and the most fun to do!” The theme was finally decided upon in the middle of October, and it was officially announced during Step Three! Once the Relay ball is rolling, two major objectives come into play; getting people to sign up and getting people to donate. One of the main ways that the committee accomplishes this is by hosting mini Relay events, with their most recent one being a few weeks ago! Known as their “Fall Kick Off,” the committee hosts this in order to raise awareness and encourage people to sign up early. Jill added, “We want Relay to be a year round thing, and we have a large goal to reach. It’s much more obtainable if we spread our goal out from the beginning of the school year to April, rather than trying to reach it from mid-January to April.” Fall Kick Off included games, food, and different fall activities. When asked about why mini events are so important, Kara said that it’s important that people learn about the organization itself before people forget about it, since the actual Relay for Life is so far away. Step Four: Checking In…What’s Next? Over the course of the next several months, little by little the committee will be preparing for the long-awaited night in April. Until then, the committee meets weekly in order to check in with one another, to see how things are progressing, and to see how they all can work together to make this the best Relay possible. More specifically, the committee is also planning the Luminaria Ceremony, which is one of the most popular events at Relay. Sophomore student Erin Prachar, who is member of the Luminaria Committee this year, said that luminarias are “bags you can buy that light up and dedicate to whoever it is you relay for.” She also added, “I love being a part of the Luminaria Committee because the purpose of the luminaria is to remind us all why we relay, which is something I hold very close to my heart.” It also during this period where the committee starts to think about…decorations!!! Making and creating beautiful decorations is a crucial part to Relay, and even more so this year since the committee has decided to give this Relay a theme. Step Five: Hurry Up! It’s Relay Day! After months of planning, fundraising, blood, sweat, and tears, the day has arrived. It’s April, folks. Relay for Life is here! The day of the event is quite possibly the most stressful, which is why starting to set up Hagan Arena early is the committee’s best option. Setting up begins in the late morning/early afternoon and doesn’t end up complete until around 7pm; the time where Relay participants arrive! However, because this year’s Relay has a theme, Kara says it is quite possible that they will have to start setting up even earlier before the day of the event. Relay for Life brings in about 1,000 people to Hagan Arena, with the event lasting for 12 hours (whoa). 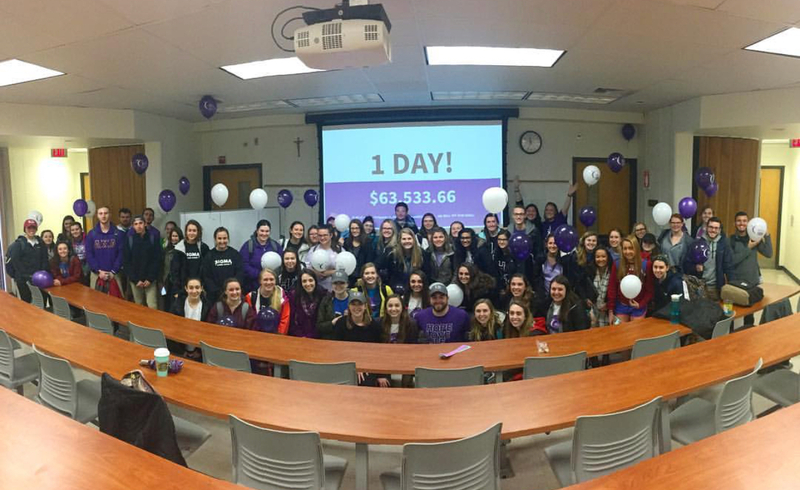 Last year, SJU raised $88,000 for the American Cancer Society, and they are hoping to surpass that amount this April. While it is too late to join the Relay for Life committee, there is still the option of signing up and participating in the event! When I spoke with Jill, she urged me to include that there are already 25 teams signed up for the event, and you can sign up with any of those teams, make your own, or just sign up as an individual! If you are interested, you can sign up at relayforlife.org/pastjoes. The work of the Relay committee is selfless and long-lasting. Every Relay member says that working on the committee shows the great impact that you can make in people’s lives, because it’s possible that everyone has some tie to cancer, unfortunately. Playing a part in Relay also creates a sense of community on campus, and quite honestly what could be better than that? Take a stand against cancer today, and don’t forget to thank a committee member for everything they’ve done; it’s been a yearlong effort! All content was submitted and approved by SJU Relay Executive Board Chair Jill Rogers. Hey there Hawks! My name is Emma and I'm a sophomore Communications major. I love everything about being a Comm major, because it's given me so many amazing opportunities, like writing articles for HawkChill! I like to read, write, work out, drink coffee, and be with my friends and family. 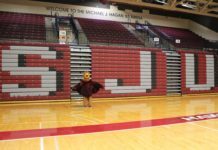 I love SJU; it's atmosphere, the people, and I especially love writing about it for HawkChill!